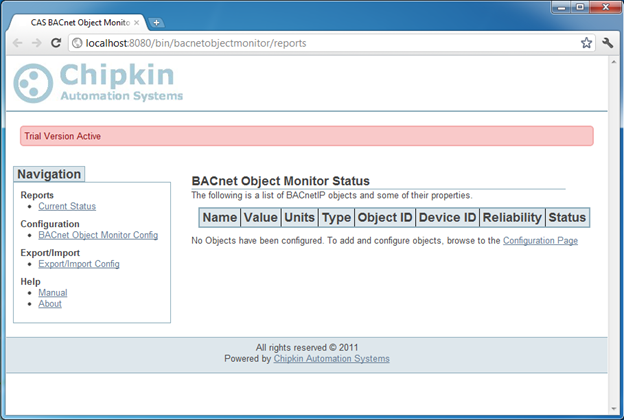 Download the BACnet Object Monitor FREE!! Or, for more information, CONTACT US! What is the CAS BACnet Object Monitor? The CAS BACnet Object Monitor is a software designed to run on a Windows computer for the purpose of testing a connection to a BACnet IP device, or to monitor a BACnet IP device. A user can configure BACnet data points either manually through a configuration screen or by importing a configuration file. The user can then view connection and status details of the configure points on the status screen. Note: If this application is being used on a trial basis, the notification banner will display the “Trial Version Active” message. The Trial Version limits the user to monitor a maximum of 3 BACnet objects. The application must be installed on a computer running a Windows operating system. The computer that the application is installed on must be on the same subnet as the BACnet IP device to be monitored or tested. The BACnet IP device being monitored or tested must have objects of types: analog input/output/value, binary input/output/value, or multi-state input/output/value. Please Read the License Agreement before downloading this utility. Q1: No web page appears once the application has started. Q2: I’ve configured the BACnet IP device and objects, but the values are not refreshing and the background in the status page is red. A2: Make sure that the BACnet IP device is connected and is on the same subnet as the computer this application is installed on. Also double check the configuration of the device. Check the IP address, Device ID, and network. Check the port. Q3: I’ve configured BACnet objects, but the default values never change. A3: Make sure that those objects actually exist and contain values on the BACnet IP device. 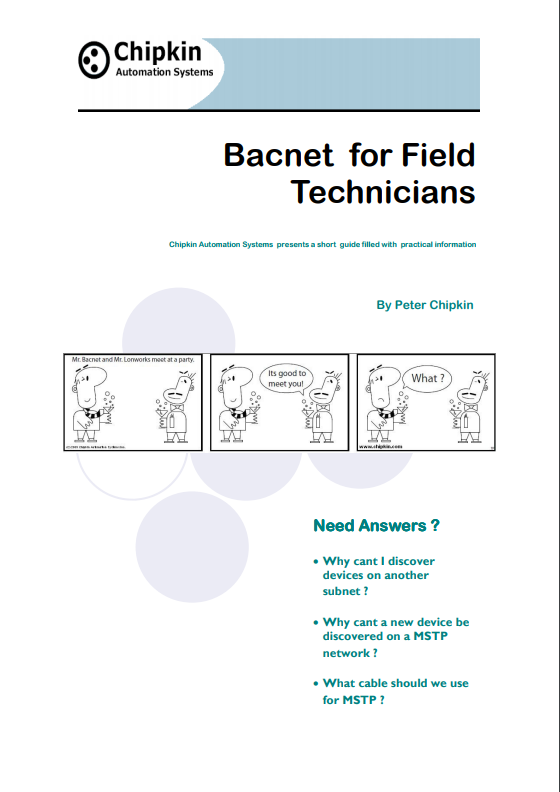 Q4: The BACnet IP device got disconnected, what happens? A4: If the connection to the BACnet IP device is interrupted, or there was no connection in the first place, the table entries for the objects on the Status Page will have a red background indicating a loss of connection. Q5: How do I check what version of the CAS BACnet Object Monitor I am using? A5: Browse to the About Page. The About Page contains all the version information of all the protocols and HTTP drivers installed with this application. Learning about Modbus? Want to update your Modbus knowledge? This free EBook will guide you through basic and advanced Modbus topics.